Let’s be different - Our mission is to push the boundaries of art and design in the emerging field of VR gaming and design. VR Solutions - lead to an increase in visual and analytical bandwidth to enhance confidence, leading to the shortening of negotiation times, design approvals and sales performance. 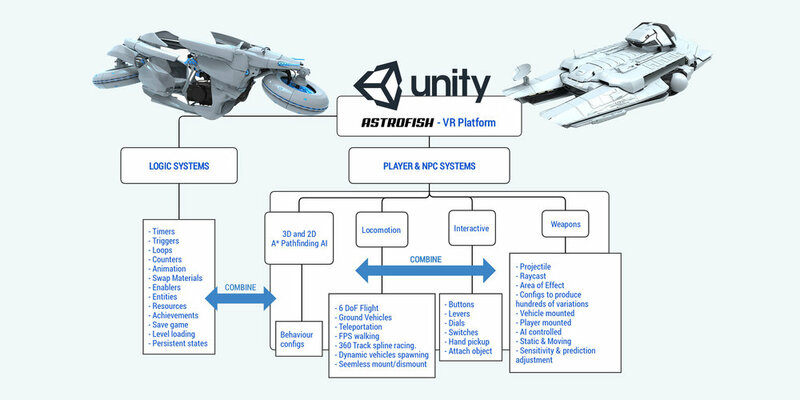 Astrofish Games has spent two years developing our bespoke VR project template containing all of the systems we have built for our games. This VR Platform provides a massive jump-start on any new project, as we have endeavoured to design modularly when building anything new. These systems are well tested and built for intuative UX such that we can confidently use them in our own products. Our unique and highly developed locomotion systems have been thoroughly user tested both at events and live in existing games. As locomotion in VR is one of the most difficult to get right, our focus on freedom, control and above all else - comfort has given us an unrivaled vehicle based locomotion system that we can instantly apply to new products. In general, this platform helps reduce development costs on prototyping and/or small games substatially, the cost saving of which we are able to pass on in the form of quality, polish, complexity and a reduced development budget.